Hiding labels and sub-labels is a good way to make your form look short and compact. When you hide labels and sub-labels then you can use placeholders in form fields to convey what data should be filled. In such cases the placeholders should look good and you can do that by using Gravity Forms Styler plugin. There are two methods to hide labels and sub-labels in Gravity Forms. 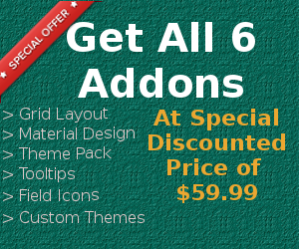 Hide all of them in one click using the Styles & Layouts plugin. Hide them by changing the setting in each individual field. In this article, I will explain both the methods in detail. Hide Labels and Sub Labels using Styles & Layouts for Gravity Forms. Styles & Layouts for Gravity Forms is a free WordPress plugin using which you can design and customize the look of your forms without using any CSS. One of its features is the ability to hide labels and sub-labels in one click. First, go to the website’s dashboard and then click on Add New under Plugins menu. Search for ‘Styles & Layouts’ plugin and then install and activate the ‘Styles & Layouts for Gravity Forms’. Now open the front end view of the page in which you have added the form on your website. Go to Customize menu and then click on ‘Styles & Layouts GF Forms’. You now need to select the form for which you want to hide labels and sub-labels. After selecting form you will see plenty of design controls. 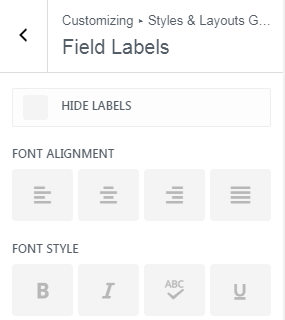 Open the Field Labels section and then click on ‘Hide Labels’ setting. Now go to ‘Sub Labels’ section and then click on ‘Hide Sub Label’ setting. The good thing about using the Styles & Layouts plugin is that you will get a live preview of the changes you make. This way you will know even before making the changes live whether your form is looking good or not without labels and sub-labels. If you liked the new design of your form then click on the ‘Publish’ button in the customizer menu. This makes the design changes live on your website. This method can be a pain to follow if you have a large form because you will need to go through each field manually and hide the labels and sub-labels. Also, you don’t get an immediate live preview so, just in case you don’t like the look of your form you will have to manually revert all changes back. From your WordPress dashboard go to Forms and then edit the form. Now expand the settings section for the field by clicking on it and then go to the Appearance tab. 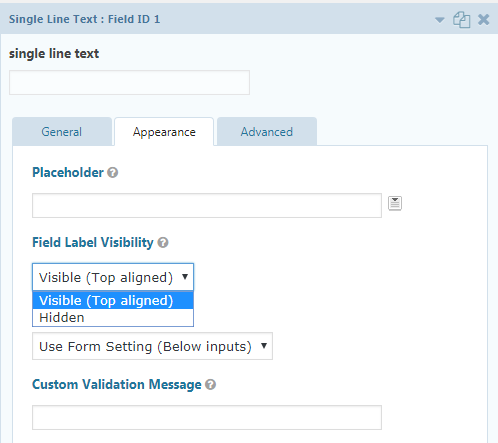 Here you will see Field Label Visibility and Sub-Label Placement option depending upon which field you are editing. Select Hidden option under the above settings. If you face any issue with any of the above methods then let me know in the comments section and I will get back to you with a solution.